You’ve seen them on the ‘big blogs’. 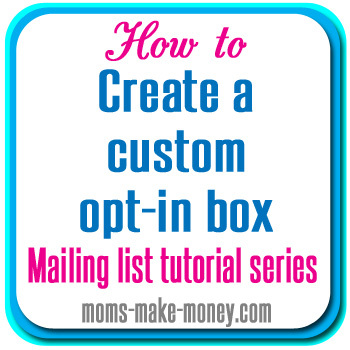 The custom opt-in box or special offer boxes at the bottom of their blog post asking you to sign up and get a copy of the latest e-book or offer. Beautifully designed and very eye-catching boxes to collect your email address and add you to the mailing list. Sometimes the offers can be a little cheesy, but there is no doubt that these work and convert visitors into valuable subscribers. And now you can get your own custom opt-in box too. Setting up a newsletter series – review. 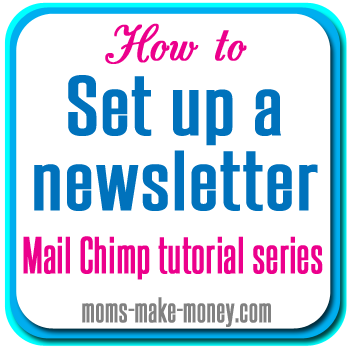 If you have been following along with the Set Up a Newsletter series, then you will have set up your account and set up a blank list, set up the forms necessary to collect email addresses, added a widget to your sidebar, added a custom tab and sign up form to your Facebook page, and then customised the sign up process including offering coupons and downloads. At the bottom of those posts and right underneath this paragraph, you will see a custom opt-in box. It only appears on those relevant pages, and relates specifically to that content, and has a strong ‘call-to-action’ inviting readers to sign up for the newsletter if they liked what they read. Subscribe to keep learning and earning ! Never miss an important tip or offer with the weekly posts round-up email and special subscriber only info and newsletters. No spam promise, subscribers are special! Until now, I’ve only read about bloggers having to pay a designer and web developer to write this custom box for them, with rates typically at around $75 to $150 for a single box. But what if you want several boxes, a different box for each category, another box for your high traffic posts, then a special one for a series you are running this month (see the Sew A Skirt series with it’s special opt-in box), and a sidebar sign up – that is going to get costly if you have to get someone to design and code this for you. And that’s why I was determined to find alternatives. The first product I trialed was Optin Skin. At $67 it’s still affordable, but after testing it out on So Sew Easy and finding that it didn’t track impressions on my boxes for the split-testing, I tried it with Moms Make Money – with disastrous results! Installing Optin Skin to this site took the whole site down immediately and just gave me a white screen with a nonsensical error message. Thank goodness for my Backup! There were no replies to my emails to support and I had to open a Paypal dispute to get my money back. I don’t normally post negative reviews, but do recommend that you avoid this product. Magic Action Box Pro works like a dream and takes only minutes to set up. You can have custom opt-in boxes set up and on your site and posts within just a few minutes. There are pre-designed templates you can use, but they are also fully customisable and you can fully design your own using their easy to use interface. Watch this video to see just how easy it is to set up and customise your own opt-in and social sharing boxes and add them to your posts and sidebar. Why get Magic Action Box? Limitations – sorry, WordPress only. Coming in a later release, split-testing and analytics to see which boxes work best for your site. This is currently under development and the developers tell me it is scheduled for the next release soon. This will be a great upgrade – you will be able to randomly trial two different boxes on the same post and follow the statistics to see which one converts the best – very useful to make sure you get the maximum number of subscribers. There is also a limited functionality version of Magic Action Box which is free. This does allow you to create your own opt-in boxes for posts and pages with limited options, but no sidebar widget. If the $47 is too much of an investment right now, start with the free version and give it a try. When you decide that you love it (and you will), then upgrade when you can to get access to the other features for the Pro version. Make your own custom opt-in boxes, social share boxes, sales boxes, forms, sidebar widgets and more. Customise to match and blend in with your site design, or compliment and stand out. And remember – please share this post and subscribe to my newsletter – look, there’s a handy box below! Great tips! I think this is so easy to use when connecting with readers! Thanks for sharing at Pinworthy Projects. Love ALL of your tips, thanks so much for sharing these!!! Super tips! Thanks so much for sharing on Social Media Blog Hop today. Funny, you are the first person I have seen to write an honest review about optin skin. I have had nothing but problems since i have installed it too. But every one else seems to rave about it. That’s the difference with my site. You can get a healthy affiliate commission by recommending optin skin, so that’s why there are so many sites out there publishing great reviews of this product, and trying to get you to buy it. My site is different. It really is totally honest and I won’t let a thing like a commission get in the way of a genuine review. If there is a free product that does the job, I’ll recommend that instead. I would rather keep my reputation and integrity than make a few dollars off the back of a product I don’t genuinely recommend. Thanks for noticing! This is super tips. Thanks a lot. I learned a lot from your site.